Buy Clearspring Organic Japanese Sweet White Miso - 250g in the UK from our online shop or directly from our independent Scottish store. Clearspring Sweet White Miso is a short-aged Kyoto style miso with a wonderful creamy richness and a slightly salty sweetness, traditionally made in small batches to maintain its special quality. Simply pop your seasonal veg in the oven and glaze with this deliciously versatile dressing. This recipe contains 3 tbsp Clearspring Sweet White Miso?. The golden colour and light, sweet flavour of this nutritious soup makes it a good choice during the winter months. This recipe contains 80g Clearspring Sweet White Miso. Where can you buy real Sweet White Miso Paste safely online? 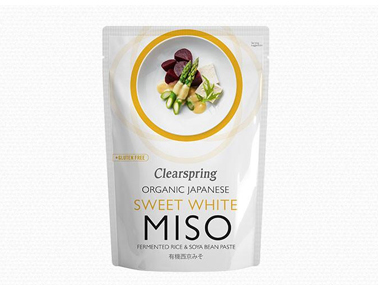 If you are wondering where you can buy Clearspring Organic Japanese Sweet White Miso - 250g safely online in the UK, then shop with us. Sweet White Miso Paste - Clearspring Organic Japanese Sweet White Miso - 250g in Miso & Miso Products and Miscelanious Ingredients.